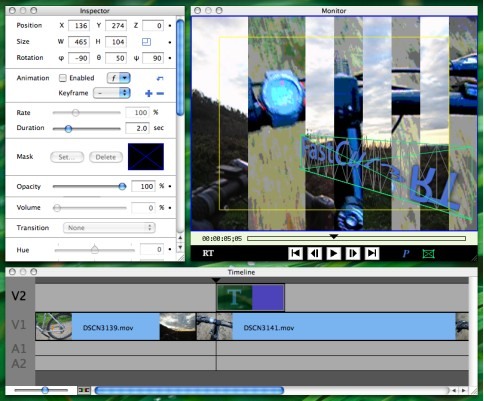 FastCut offers advanced video editing in real-time. Experience outstanding performance. FastCut uses the power of the GPU* for accelerated graphical calculations. FastCut is a full-featured video editor. It brings 3D motion & effects keyframe animation, masking and keying, video transition and filter+special effects, an integrated ATSUI live title editor with title effects and so much more. FastCut has been designed for real-time processing from the beginning. The RT-engine is based on OpenGL to benefit from hardware acceleration and uses the CoreImage technology for filter effects. You don't need the fastest machine to apply complex effects to multi-layer 3D compositions. FastCut dynamically scales the playback quality if appropriate for optimal playback performance. The clean and intuitive interface makes it very easy to use. This is a must-have tool for everyone editing video on the Mac. В· Among the dozens of new features and enhancements in FastCut 3 are animated title effects, special effects, improved 'dynamic RT', more versatile clip arrangements commands, native support for the new .fvf screen movie format and a feature called 'animation presets' that helps to instantly setup animations [or reuse animation setups]. В· FastCut 3 comes with fgrab, a new super-fast screen movie capture utility. fgrab is not only the fastest screen movie capture utility (70 % faster than Snapz Pro X 2, whether you compare it on PowerPC or Intel), with the new .fvf screen movie format there is no longer an export procedure necessary after you captured the screen. .fvf clips can be added to FastCut movie projects for further processing. PPC / Intel, Mac OS X 10.4 or later. Is FastCut For Mac your software?